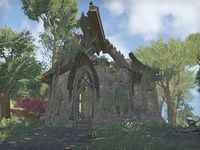 Monkey's Rest is a ruined building in southern Auridon, just northwest of the city of Vulkhel Guard. As the name implies, monkeys gather here in great numbers. This makes it a decent source of their drops, such as bananas and White Meat. A copy of Auridon Explored, Chapter II can be found inside, as well as two empty soul gems in the fireplace. A chest can be found at the north end of the building, hidden behind a stone support. The Windy Glade Wayshrine can be found to the south.